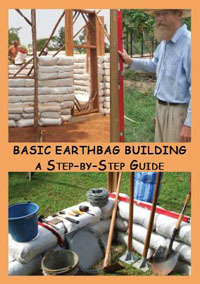 I am pleased to announce that Owen Geiger’s Basic Earthbag Building DVD is finally available for purchase. Owen is a natural teacher who understands how to present information in a clear and understandable way and this DVD is excellent for introducing folks to the basic essentials of sound building practice using earthbags. Much of the DVD is derived from actual instruction at workshops, so you witness the whole process from the ground up. After an introduction to the tools and supplies that are necessary for building, they construct a small sample wall with a rubble trench foundation. Every step is fully explained and demonstrated as the wall proceeds. The second portion of the DVD takes you through the process of building a functional cool pantry that is attached to a house. Here you can see how doors can be framed and roofs attached. There are many tips and tricks that emerge from watching that could be invaluable in constructing most any project. At the end there are some bonus scenes that include tips for building a dome, an animated fly-through of Owen’s Enviro Dome, and a tour of Owen’s completed Earthbag Roundhouse. With over three hours of solid instruction, this DVD would be a valuable addition to anybody’s building library. You can review portions of this DVD by exploring the short clips that are shown on Owen’s YouTube Channel. And you can purchase the DVD directly from the manufacturer for $28. What a wonderful way to build structurally sound housing for the victims of natural disasters. They look relatively easy to construct and would really help the community.